In the spirit of Mothers' day I am posting the recipe for my mom's favorite dessert. I had the recipe saved from long time ago, when foodnetwork still aired some good shows hosted by some good chefs. When I made it the first time, my mom admitted that this is by far the best dessert she ever ate. So now this is the dessert I make each year for my mom's birthday and on Mothers' day. In a medium saucepan, combine 1 cup of the sugar with 1/4 cup of water, tilting the pot so that the water is evenly distributed. Cook over high heat, swirling the pan (but never stirring) until the sugar melts and turns to a deep amber color, 4 to 6 minutes. Immediately remove from the heat and, working very quickly, pour the caramel into a 2-quart porcelain casserole dish. Swirl the caramel to completely cover the bottom and partly up the sides of the casserole. Set aside to cool completely.Preheat the oven to 325 degrees F.Combine the milk, remaining 3/4 cup of sugar, orange zest, lime zest, and vanilla bean in a medium saucepan and bring mixture just to a boil. Cover pot and allow mixture to steep for 15 to 20 minutes.In a medium mixing bowl, combine the eggs and egg yolks and whisk to combine. Add the hot milk mixture, little by little, and whisk lightly to combine. Strain the egg-milk mixture through a fine-mesh sieve into the caramel-lined casserole. Place the casserole in a larger baking dish or roasting pan and add enough hot water to come halfway up the sides of the casserole. Lay a piece of aluminum foil over the pan so that it is lightly covered and bake, undisturbed, until custard is just set, about 1 hour. (The timing may vary slightly depending on the baking dish used.) 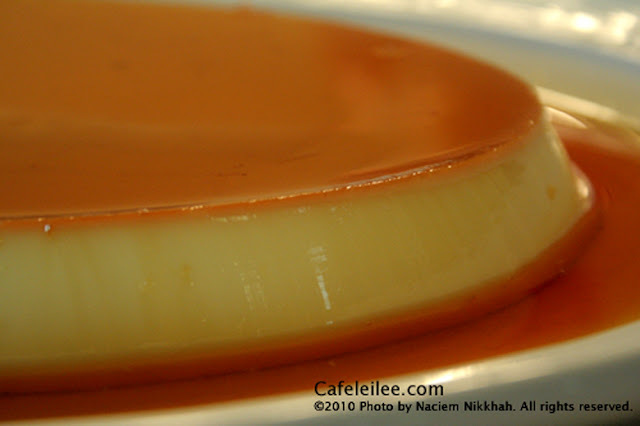 Remove the flan from the oven and transfer to a wire rack to cool. Cool completely and transfer to the refrigerator and chill, preferably overnight.When ready to serve, run a sharp paring knife around the edge of the custard and shake the custard slightly to loosen. Invert an appropriately sized platter or serving dish over the casserole dish and, working quickly and holding both the casserole and the platter together, turn the casserole over and place the platter on a flat work surface. Gently lift the casserole off of the platter; the custard should gently fall from the casserole onto the platter. If not, tap the casserole and platter lightly on the work surface to help dislodge the custard. Let sit at room temperature for 15 minutes to warm slightly before serving. 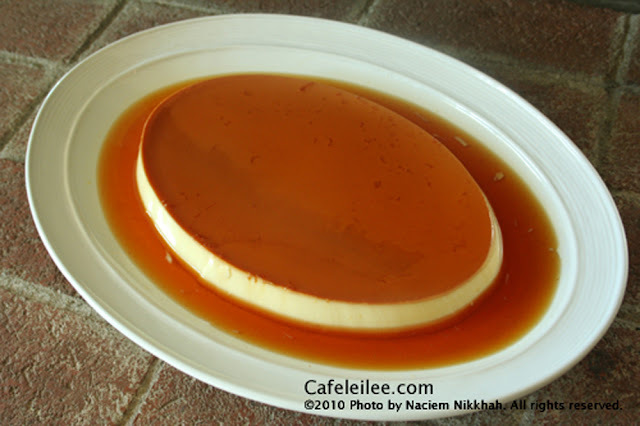 Serve slices of the flan with some of the caramel sauce spooned over top.Cook's Note: Flan is best served cool or at room temperature and is more readily turned out of the mold after sitting overnight. امروز روز جهانی مادر هست و به این مناسبت اینجانب تصمیم گرفتم که دستور محبوبترین دسر مادر گرامی را پست کنم. این دسر در اصل یک دسر مکزیکی هست. نوش جان و روز مادرتون مبارک. توی یک قابلمه کوچک ۱ پیمانه شکر را با ۴/۱ پیمانه آب مخلوط کنید و روی حرارت زیاد قرار دهید. با دسته قابلمه مرتب قابلمه را تکان دهید تا شکر آب شود و قهوه ای رنگ شود. قاشق به این مخلوط نزنید. شکر آب شده و قهوه ای شده را فوری از رو اجاق بردارید و ته ظرف بریزید. ظرف را تکان دهید تا شکر قشنگ ته ظرف را بگیرد. فر را روی حرارت ۳۲۵ درجه فارنهایت یا ۱۶۰ درجه سانتیگراد روشن کنید تا گرم شود. تا شکر سفت و خنک شود، شیر را با پوست پرتقال وپوست لیمو و وانیل در یک قابلمه لعابی بریزید و بگذارد به جوش بیاید. سپس حرارت را کم کم کنید و در ظرف را بگذارید تا شیر خوب طعم پوست پرتقال و لیمو را به مدت ۱۵ تا ۲۰ دقیقه بگیرد. بعد از حدود ۲۰ دقیقه پوست پرتقال و لیمو را از شیر خارج کنید. تخم مرغ و زرده تخم مرغ را خوب بزنید. سپس شیر داغ را کم کم به تخم مرغ اضافه کنید و همینطور با همزن بزنید تا تخم مرغ نبندد. این مایه را روی کارامل آماده شده (شکر سفت شده) بریزید و ظرف را توی ظرف گود بزرگتر بگذارید و داخل فر بگذارید. به ظرف بزرگتر آب اضافه کنید تا تقریبا به اندازه نصف ارتفاع ظرف آب باشد. در ظرف فلن را با فویل بپوشانید تا آب داخل آن نشود. بگذارید فلن حدود ۵۵ دقیقه بپزد سپس آنرا از فر خارج کنید و بگذارید کاملا خنک شود. بعد بگذارید داخل یخچال بمدت حد اقل ۴ ساعت بماند. برای نتیجه بهتر بگذارید فلن به شب تا صبح در یخچال بماند. موقع سرو کردن، با یک چاقو کوچک فلن را از جداره ظرف جدا کنید و آنرا در ظرف مورد علاقه برگردانید.